Now that we are well into the semester, fall is finally here, and the changing of seasons typically results in a sea of yoga pants and hoodies. While it may be easy to throw on sweats for an early morning class, it’s always best to keep in mind that your teachers and peers could be future employers; you just never know who you will run into! Alyssa caught my eye for this very reason. 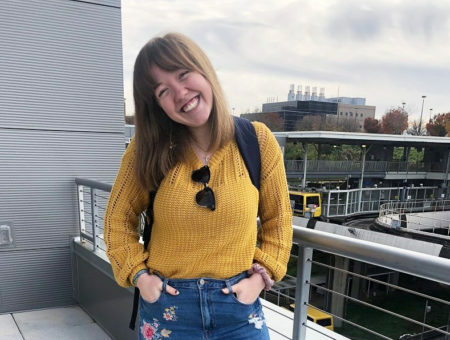 She didn’t take the easy road, which made her stand out amongst the other students on campus. 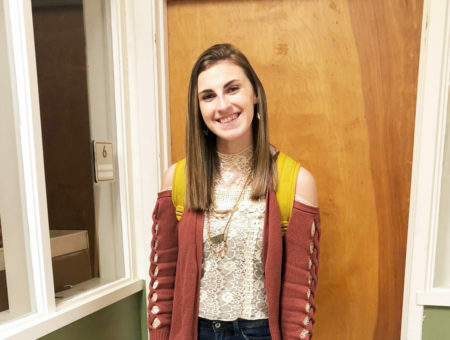 From her funky pants to her cool jewelry, Alyssa created a perfect outfit for wearing to class. Alyssa’s necklace immediately drew me in. I am obsessed with her contemporary style that has little touches of vintage elements. 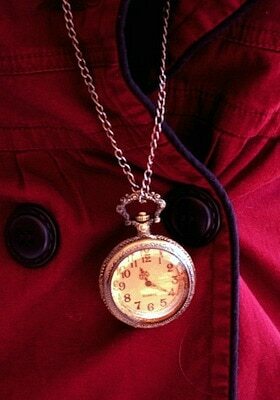 This cool timepiece necklace could easily be from a different era, making it an immediate conversation piece. Brogues are an incredibly versatile footwear choice. They look amazing with cuffed jeans, skirts, dresses, and even shorts. 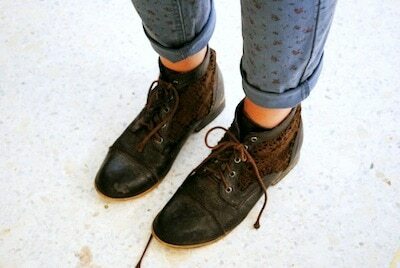 These brogues, with their lace side panels, are the perfect mix of cute and casual. These shoes keep in line with that throwback look Alyssa has going on, and they could not be more in-style right now. 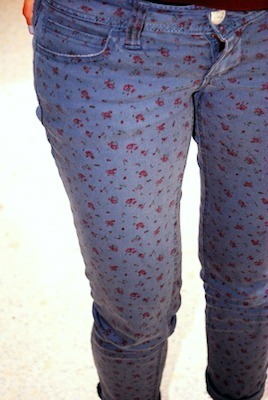 It seems like everywhere you look, printed pants are around, and this pair is a fresh twist on a plain jean. The small, red floral print doesn’t overwhelm Alyssa’s outfit, but adds a little extra oomph. Ear cuffs are a fun, edgy jewelry trend that we’re still loving this season. While many people are on the fence about them, Alyssa went right ahead with her accessory choice and I couldn’t respect her more for it! It’s a really cool look, especially with her cropped haircut. What do you think of Alyssa’s look? 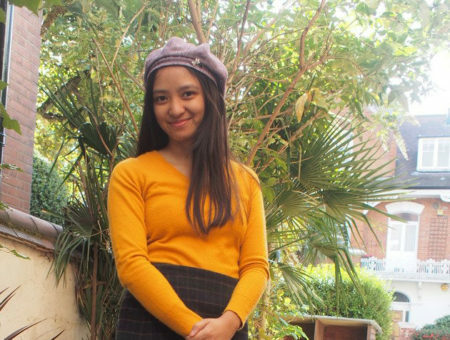 Do you think her outfit is perfect for class? She loves maroon; what colors are you drawn to this season? Do you love the vintage elements in her outfit? Let us know your thoughts below!